There are some dishes which I really miss in Bangalore. These might not be something very exotic. Some of them are very regular- roadside ones! 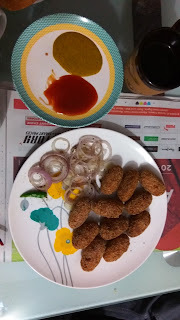 Vegetable chop is one such snack. It looks tough to prepare so I never quite paid any heed to learn the recipe. But I guess my cravings surpassed my laziness and I quickly learned the recipe. To my surprise, it came out really tasty.